Photo 1 of 48, SOLD! 1966 Chevelle SS! 138 Vin! SOLD! 1966 Chevelle SS! 138 Vin! Sorry SOLD! 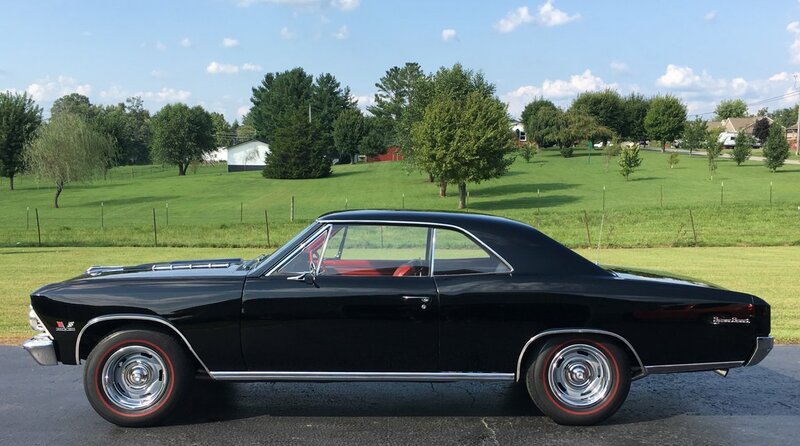 1966 Chevelle SS Vin # 138! Ready to go! NICE 1966 Chevelle SS 396! Now running a 454 Engine, was told had low miles on it. Muncie 4 Spd Trans, PS, PDB, 12 Bolt Rear / 331 Gears! New Disc Brake Kit, New Flowmaster Exhaust! Factory Tach & Gauge Package! New Black exterior paint with new Red Bucket Seat Interior! 4 Spd Console with Knee Knocker Tach! GA car now in KY....Super straight body, floors and trunk! NEW Red Bucket Seat Interior, Seat Covers, Headliner, Door Panels, Package Tray, Carpet, Dash Pad, Arm Rest Pads! New Sunvisors! New Dash Bezels! All new Roof, Door, Trunk, U Jamb and Vertical Weatherstripping Kit! New Window Felts and Fisher Sill Plates! Car has New Bumpers, New Grill Assembly, New Tail Light Bezels! All NEW SS Emblem Kit! New 4 PC Rocker Moldings....list goes on! Running NEW Set of 15x8 Rally Wheels with NEW Caps and Rings, NEW Red Line Tires! Slick Black SS for the money! Call for details 606-878-5839 or 606-521-4156. Album by Herman's Classic Cars, LLC. Photos by C. Bowling. 1 - 48 of 48 Total. 46165 Visits.